A graphical overview of your won and lost opportunities. The second of the three chart sections deals exclusively with opportunities that are won or lost and are no longer in the pipeline. The percentage of closed opportunities that were won in the given date range. The percentage of closed opportunities that were lost in the given date range. 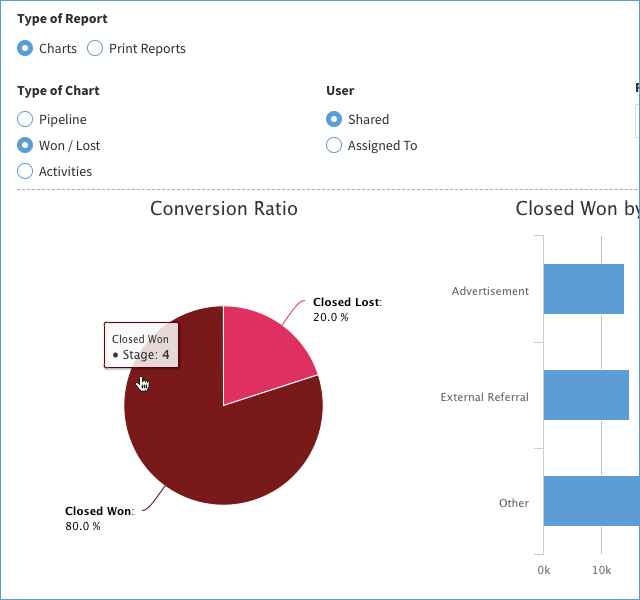 Hovering over the pie chart displays the number of won or lost opportunities. In this example, four opportunities were won, accounting for 80% of the total. This shows a list of the four opportunities closed as won. 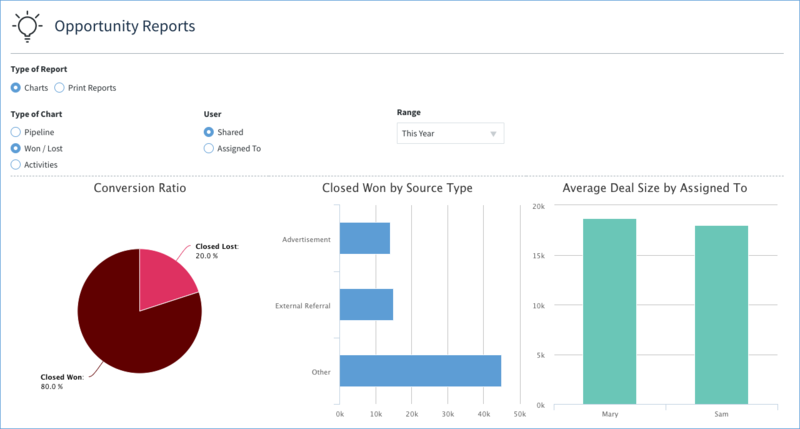 The number of closed won opportunities from a given lead source in a given date range. If no opportunity came from a given source in the date range, that source is omitted from the chart. The total amount of revenue generated by all opportunities from a given source. The chart groups opportunities based on which source was assigned. If no lead source is assigned to an opportunity/opportunities in the date range, they are displayed as "undefined" in the chart. In this example, won opportunities originating from the lead source Advertisement generated $14,000 of revenue. 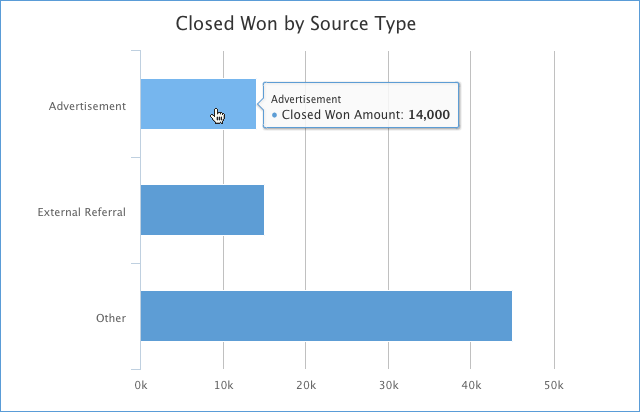 This shows one closed and won opportunity that originated from the lead source of Advertisement. The users with closed won opportunities in the given date range. If a user has no closed won opportunities in the date range, that user is omitted from this chart. The average amount of revenue generated by all of their closed won opportunities in the date range. 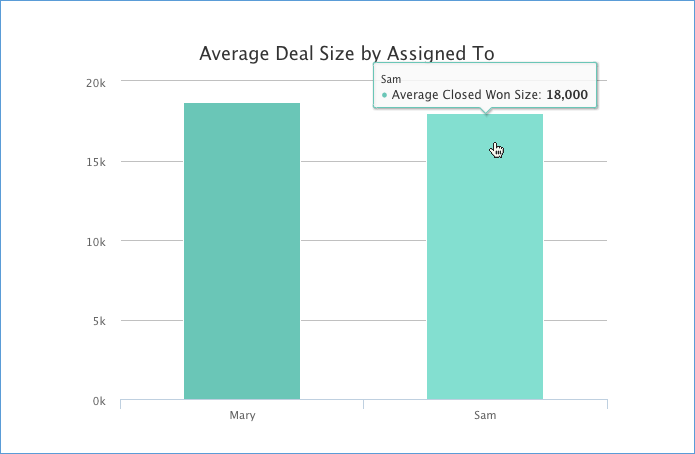 In this example, Sam's closed won opportunities average out to $18,000 under Average Deal Size by Assigned To user. This shows Sam's one closed and won opportunity for the date range.